The HUD does not need to be wired into anything for power. It is simply PLUG and PLAY. You just plug it into the OBD port and you are done. It is that simple, installation takes less than 10 seconds. Once its plugged in just set it on the dash and you are ready to go. 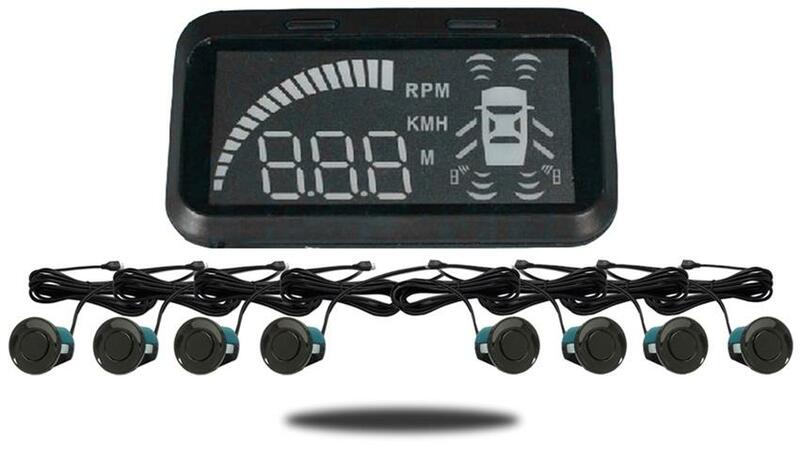 The LED Car HUD will reflect on your windshield to display a host of exciting information. From speed to fuel consumption you will see it all. This is the kind of feature that only the most advanced and luxurious cars offer. You can now see all the important things right in front of you. The TadiBrothers Head-Up Display projects relevant driving information directly into the driver’s line of sight. You can process the information faster than ever! It projects onto your windsheild with an easy to read color image. The image is also displayed in a great position so its simple to see while driving while not blocking your vision of the road. During parking, the system employs those sensors to detect nearby objects that might not be in your field of view, using audible signals and illuminated displays to help you pull in. When the car approaches too close to an object in the detection zone, an alarm sounds, increasing the intensity in proportion to distance from the object. There are also SIX stages to the alarm as you near an object. The system begins to emit audio at 8 feet. Unlike other Car HUD systems ours have sensors that go into your bumper to make the HUD even more effective and relay even more information to the driver. Some of these systems have more sensors than others.